Take a domestic flight from Delhi to Leh. In Leh, visit the ancient monasteries of of shey , thiksey and Hemis gompas. Now from leh move towards the spitok by a jeep. Here you can see the another ancient gompa i.e. Spitok Gompa, built around 500 years ago. 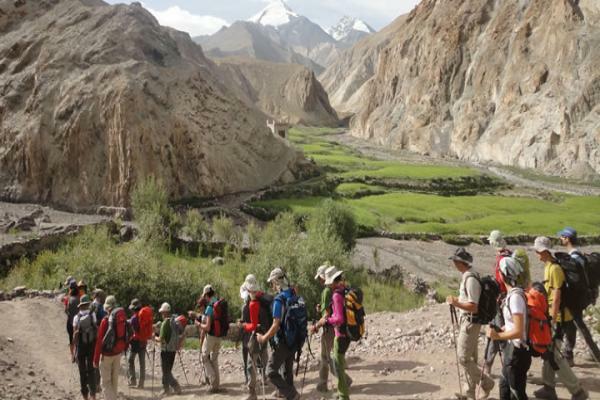 Begin your trek, by crossing a bridge and move towards in the south east direction to the river Indus. Trail towards the Yurutse through Rumbak Nala . here you will see the marvellous view of the snow capped Stok Mountains. At Yurutse village you will find fields of barley and potatoes. Overnight in Tents. Now move yourself to the Skiuvia Ganda la Pass, on the way you will see the Zanskar range and Himalayan range.At skiu, the rivers coming from Markha valley and Shingo re meet together. It is the most admirable ride from Skiu as it crosses large number of streams on the way. Markha is a pretty village with a deserted fort. Series of mani walls and chortens en route. It is one of the most attractive high valleys in ladakh and largely dominated by kangyaze Peak. Today one will cross to the north of the Markha, climbing to the top of the highest of the three passes, the 5,306 M Kongmaru La, with its wonderful views from the top. There are snow peaks in every direction and on a clear day the giants of Karakoram, including K2, can be seen on the north-western horizon. The trail descends to the Martselang valley, following the Martselang stream to the village of Sumdo. Overnight in tents. transfer to the airport for the flight to the Delhi.